Feeding animals can put you and the animals in danger. Wild animals, especially alligators, crocodiles and bears, should never be fed or allowed to obtain unattended food or garbage. Wild animals that receive these "food rewards" just once may become aggressive toward humans. To protect people and their property, these animals may be destroyed. Feeding wild animals increases the spread of rabies and other diseases, and can attract predators. 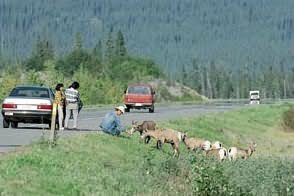 Animals fed along roads tend to stay near the road, increasing the chances of vehicle-animal accidents. Animals will eat anything with an odor including aluminum foil, plastic and other food wrappings. These can severely damage an animals digestive system and may even facilitate death. Properly dispose of boxes, wrappers, plastics, cans, etc. in animal resistant garbage containers. Human food and garbage may facilitate tooth decay, ulcers, malformation of horns, arthritis, or cause the spread of diseases such as rabies and distemper in wild animals. Many television shows, books, magazines and advertisements feature people getting close to or feeding wildlife as if this is appropriate behavior. Don't be misled serious injury or death to both people and animals.